Forradori was founded in 1901 Northern Italy’s Alto Adige region. In 1984 Elisabetta Foradori, after having completed her enological studies, completed her first vintage at her family estate. She is widely credited with helping revive the popularity and quality of the Teroldego grape. In 2002 the estate began it’s conversion to biodynamic farming and received Demeter status in 2009. Here sourounded by the Dolomiti mountains Elisabetta cultivates native grapes on both alluvial and calcarous clay soils. 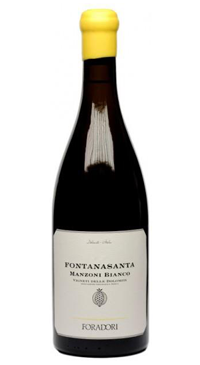 Manzoni Bianco is not the name of an Italian Vermouth; it is a 1930’s cross of Riesling and Pinot Bianco. Elisabetta grows 3 hectares of this grape at the foothills of the stunning Dolomites which she ferments for one week on the skins in cement vats before ageing in Acacia barrels for a year.